The Shakespeare Clinic did not meet from 1990 to 1992. But gathering and editing of electronic texts, mostly plays, continued. This quadrupled the size of the Clinic's test-ready holdings by 1994 and enabled the students to develop and validate over 50 fast, computerized authorship tests for over 100 full-length plays. . 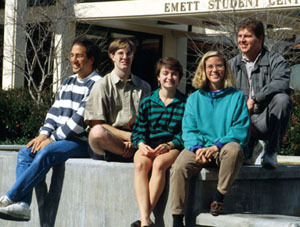 The 1992-93 team (above) started this expanded testing process and accompanied their year-end presentation to the Shakespeare Authorship Roundtable with glowing resumes of their academic achievements. These resumes appear below, with some comments on the students' subsequent careers. Theo Angelis, of Mesa, Arizona [far left], is a junior in government, psychology, and religion at Claremont McKenna College and a veteran of two Valenza computer science courses. He is co-captain of the Clinic. His Clinic project is multi-word phrases. He is an Alice Tweed Tuohy Scholar, an Ahepa Scholar, a National Merit Scholar, a Dunbar Fellow, a junior Phi Beta Kappa, and a 1993 Truman Scholarship finalist. He is president of the CMC student body. He plays the piano and teaches Greek dancing. His cause is public service in the schools. His hero is Diogenes. "His life story parallels my own." He learned about the authorship controversy from the Atlantic Monthly article and from "proud reports of Valenza and Elliott." His favorite candidate is William Shakspere of Stratford. 2000 update: Theo later became president of the CMC student body, a Marshall Scholar, a graduate of Yale Law School, a law clerk for D.C. Circuit Judge Stephen F. Williams, and an associate of the Seattle law firm which serves Microsoft. His chapter "The Price of Social Security Reform: Public Involvement in the Private Market," was published by the Brookings Institution in 1999. Lesley Beth Curtis, of Gilford, New Hampshire [center], and a senior in government at Claremont McKenna College, is co-captain of the Clinic. Her focus for the Clinic is modal analysis. She is a McKenna Merit Scholar and a 1992 Truman Scholarship finalist. She has been president of her class, president of the CMC Student Senate, co-president of the Women's Forum, and vice-president of the CMC student body. She wrote her honors thesis on crisis intervention service for teenagers. She enjoys coin collecting, running, and sailing. She won the Cold Duck prize for winning the under-25-foot class at Lake Winnepesaukee. Her cause is women and the law. Her heroines are her mother and Susan Estrich. She learned about the authorship controversy through scanning and editing Elizabethan texts for Ward Elliott. Her favorite candidate is Queen Elizabeth. Melinda Douglass, of Fort Collins, Colorado [second from right], is a junior in economics and mathematics at Claremont McKenna College. Her Clinic projects have been semantic bucketing, modal analysis, and badges and flukes. She is a McKenna Merit Scholar a National Merit Scholar, junior Phi Beta Kappa, and co-president of the Women's Forum. She runs and does weight training. Her cause is equality for women. Her heroines are Madame Curie and Ursula K. LeGuin. She plays the 'cello in the Claremont Chamber Orchestra. She learned about the authorship controversy from Professor Valenza. Her favorite candidate is Queen Elizabeth. Nate McMurtray, of Bellevue, Washington [second from left], is a junior in government at Claremont McKenna College. His Clinic project has been to implement the Hilton, Cusum, and other tests on a PC. He is a McKenna Merit Scholar; he has been Editor-in-chief of the college newspaper; he is president of the Claremont Colleges Debate Union; and he has developed and marketed three games for PC: Imperium: Geopolitics on a Galactic Scale; Line in the Sky, a Missile Command spinoff; and Video Craps. He plays the viola and french horn. He also raises tropical fish and has a yellow belt in Tae Kwon Do and Kendo. His cause is public service, specifically trade policy. His hero is Robert Kauffman. He heard of the authorship controversy from Professor Elliott. His favorite candidate is Christopher Marlowe. 2000 update: Nate became captain of the Shakespeare Clinic in its final year, 1993-94. He went on to Harvard Law School handled corporate megamergers as an associate of the firm of Cravath, Swaine, and Moore, New York, now sets up megamergers with the investment banking firm of Morgan Stanley. Aron S. Spencer, of Mission Viejo, California [far right], is a senior in economics and engineering at Claremont McKenna College. His Clinic Projects have been the Cusum and Hilton tests. He has been a tenor soloist for the Claremont Colleges Concert Choir and Chamber Choir; he has served as a missionary in Wisconsin for two years; and he has designed and distributed a Macintosh-based program for quick identification of hazardous materials. It is believed to have saved many lives and prolonged many others. He has had a lifelong interest in stylometry. His thesis is on Hilton/Morton Wordprint Methodology and the Shakespeare Authorship Question. His cause is the free flow of information. His heroes are Dad and Hugh Nibley. He plays the violin and viola for the Claremont Chamber Orchestra. He heard of the authorship controversy through his readings in stylometry, and from John Hilton, David Holmes, and Ward Elliott. His favorite candidate is Willy Wobblesword. 2000 update: Aron has just returned from research in Novosibirsk, Russia with his wife, Sarah (Ph.D. Candidate, Sociology, University of Chicago). He is currently completing a Ph.D. in Management/Information Technology at the University of California, Irvine, and serving as a consultant for a number of "dot com" startup ventures. Jennifer La Salle, of St. Paul, Minnesota [not pictured], is a senior in theatre at Scripps College. She is an alumna of the Shakespeare Clinic, fall 1989, who has done more with badges and flukes than anyone prior to 1992. She played Presidential Aide in the Scripps College production of Dido and Aeneas, 1993. She was Hermia in the Et Cetera Players' Midsummer Night's Dream, 1991, and Sarah in Playing with the Dragon. This summer she is doing nine summer-stock performances with the Cape Cod Light Opera Company, including Cabaret, Pirates of Penzance, Oliver, Music Man, and the Student Prince. She played Hilda in the Leonard Pronko production of Lady from the Sea. Her heroine, after Robert Valenza, is Glenn Close. She heard of the authorship controversy as a freshman through scuttlebutt about the Shakespeare Clinic at Harvey Mudd's Projects Day. She has no favorite candidate. Her lines are adapted from Dr. Faustus, Act I. And try the uttermost that Science can compute! Ward Elliott, Professor of Government, Claremont McKenna College, is a Harvard Ph.D. and a Virginia LL.B. His Rise of Guardian Democracy was nominated by the Harvard University Press for a Pulitzer Prize in history; he has written on smog, transportation, and population policy, as well as on Shakespeare authorship questions. He has been president of the Coalition for Clean Air; and he has held many research fellowships. He sings with the Claremont Chorale and plays guitar at student singing parties. He has served on the Claremont Bicentennial Power Lawn Mower Drill Team. He is a charter member of the Society for the Preservation of the Middle Class. Robert J. Valenza, Keck Professor of Mathematics and Computer Science at Claremont McKenna College, was born and raised in Newark, New Jersey. He has four degrees from Columbia University. He is author of the text analysis program, Intellex. He originated the concept of modal analysis for author identification and has published several articles on the subject. He is author of Linear Algebra: An Introduction to Abstract Mathematics (forthcoming from Springer Verlag) and co-author of Abstract Algebra (1986). He defined the notion of elasticity of factorization in number fields. He has written a 70,000-line data base management program for Gould Electronics. He has done more than his share of simulation modelling and signal processing. He plays the recorder. He was lead engineer for software for RCA communications satellites, and orbital analyst or mission analysis leader for six satellite launches. He has never lost a spacecraft.